In the ancient Egyptian rubbish heap of Oxyrhynchus, fragments of Euclid’s Elements were found on papyrus. Some of these salvaged scraps, such as one now at the University of Pennsylvania’s Penn Museum, were illustrated with diagrams expressing the influential work of the 4th-century BCE Greek mathematician. 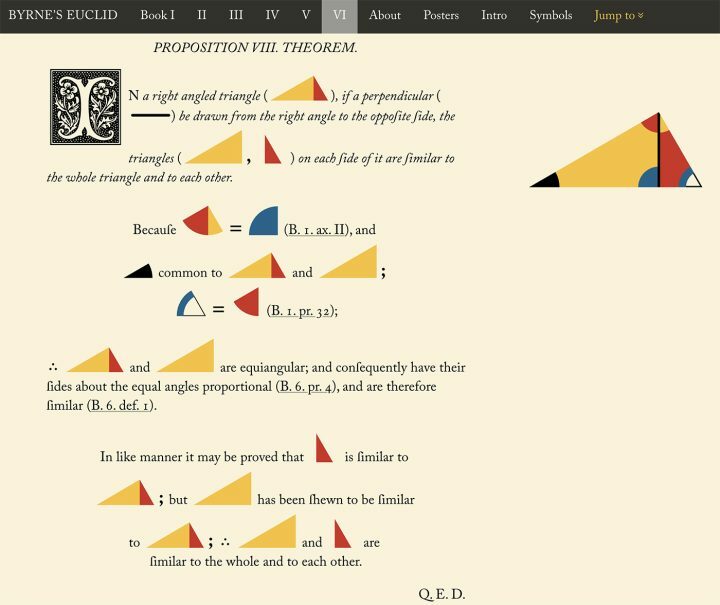 Centuries later, an Irish professor of mathematics named Oliver Byrne would transform Euclid’s mathematical proofs and propositions into one of the first multicolor printed books. 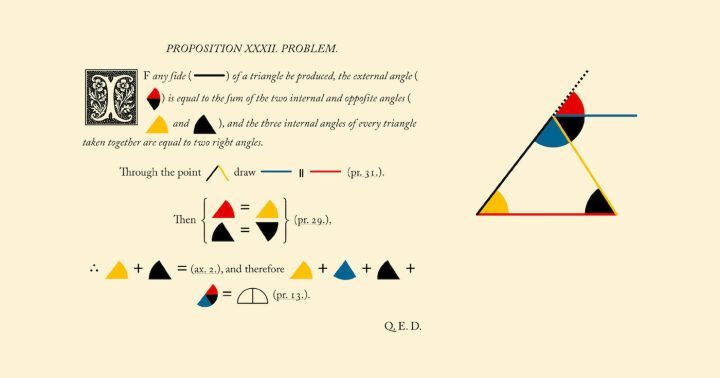 His 1847 publication — The First Six Books of The Elements of Euclid in which Coloured Diagrams and Symbols are Used Instead of Letters for the Greater Ease of Learners — used original illustrations to present the 300 BCE geometry treatise with diagrams printed in red, blue, yellow, and black to make this knowledge easier to understand. 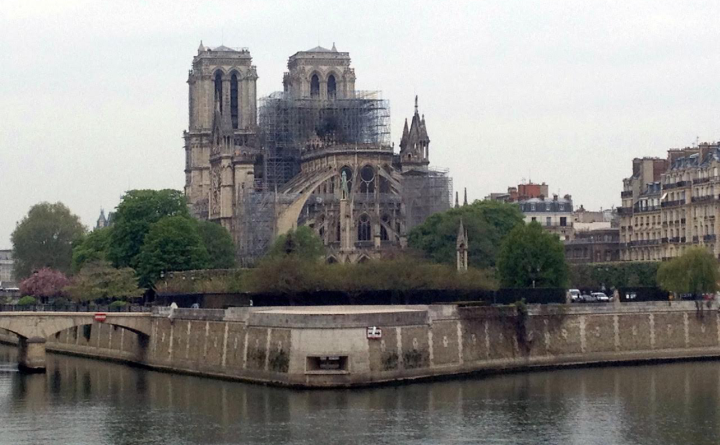 Now there’s a new version of Euclid’s Elements for the digital age. Chicago-based web designer and artist Nicholas Rougeux has meticulously reproduced Byrne’s edition of Elements as an interactive website. 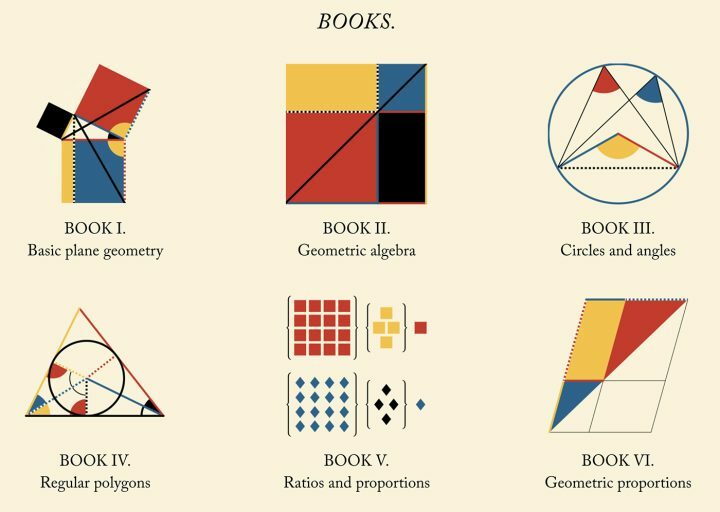 Clickable links to references, animated diagrams that indicate a shape being discussed, and relevant images that follow a scrolling text, all are aimed at making this groundbreaking work accessible. The visuals are based on scans in the Internet Archive from an edition at the Getty Research Institute. 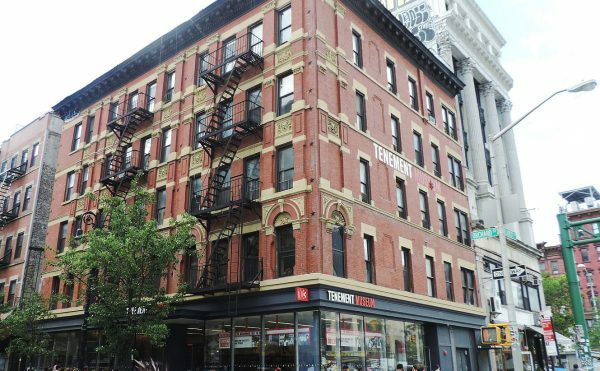 “The primary goal was to pay homage to the original beautiful publication by staying as true as possible to its design and adding just a few conveniences to make it more accessible to today’s modern audience,” Rougeux told Hyperallergic. While Byrne’s publication was groundbreaking in its design, particularly the bold use of color to depict angles and shapes in what appear like Mondrian-esque art, it wasn’t a commercial success. Due to its multicolor format, it was expensive, and not many copies were sold. 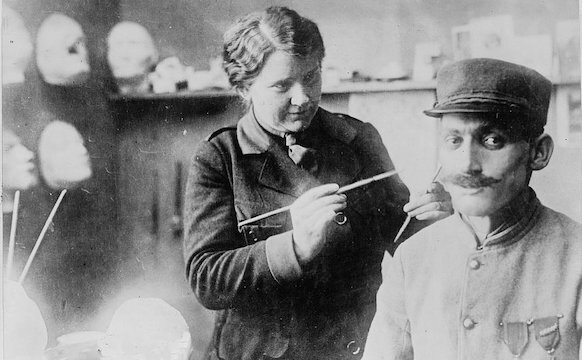 However recent attention, including a facsimile published in 2013 by Taschen, has brought the publication new appreciation. Previously, Rougeux developed a digital reproduction of the 1814 Werner’s Nomenclature of Colours, a pioneering color system. Similarly, the interactive Byrne’s Elements guards all the stylistic qualities of the original, from the typography to the exact tones of the illustrations. 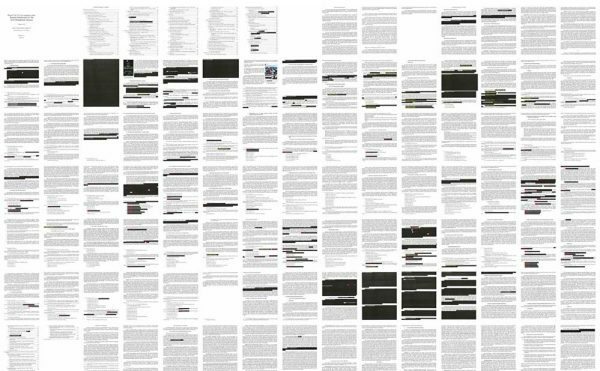 Rougeux also created a poster (for sale on his site) that features all 269 of Byrne’s diagrams. 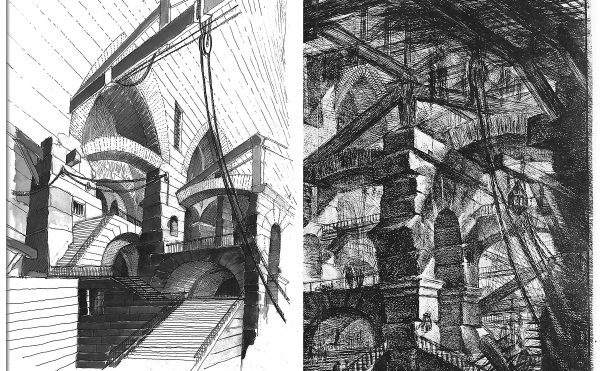 He goes into the process and challenges of being faithful to both Byrne’s design and Euclid’s geometric principles in an extensive blog post. The typeface in the book — Caslon — is still widely available, but reproducing the long “s” (ſ ), once common in old books, was its own challenge. (And takes a bit of time to get used to reading.) Decorative initials, based on 1843 wood engravings by Mary Byfield, that introduce different passages were traced by Rougeux in Illustrator, and then turned into a free downloadable font. 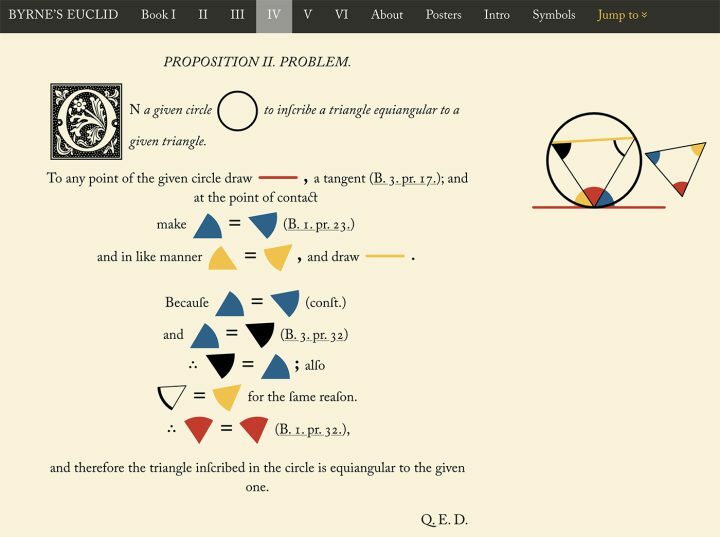 Whether scrolling through diagrams on the equality of angles in triangles, or clicking on illustrations that illuminate the properties of circles, the digital tribute to this significant 19th-century book offers a new way to interact with a foundational text for understanding geometry. 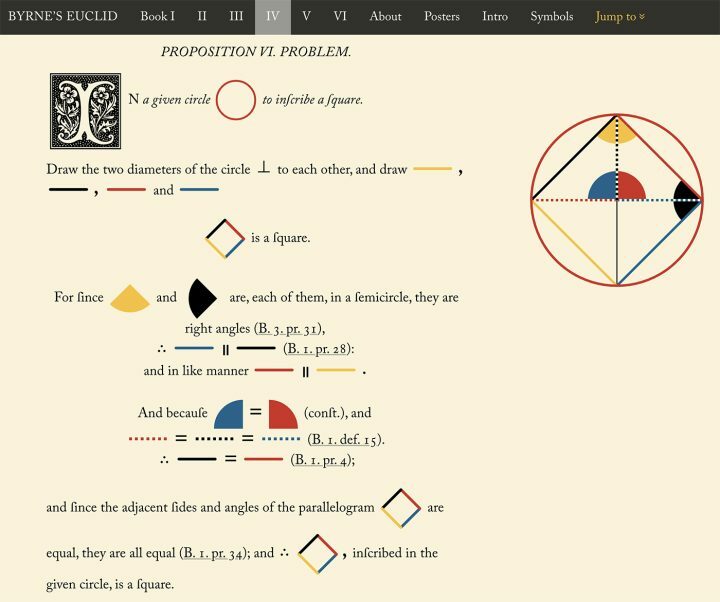 “Byrne’s Euclid” designed by Nicholas Rougeux is available to explore online.